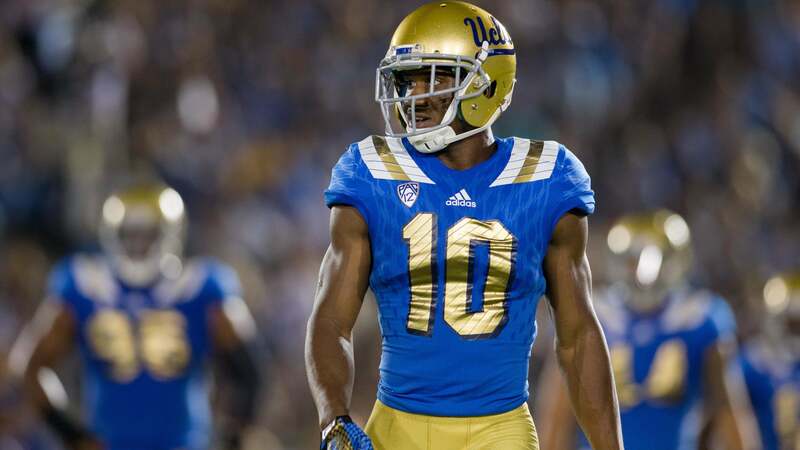 Lost in the shuffle of a deep cornerback draft class, UCLA’s Fabian Moreau is beginning to gain hype after dominating the 2017 NFL Combine. At that combine, Moreau finished in the top five of four of the events, dazzling with his 4.35 40 yard dash and 136 inch broad jump. Now, with the world officially on notice, I have seen Moreau jump on draft boards, even getting into the late first round in some mock drafts. After watching Moreau’s combine performance, I felt obligated to go back and watch his tape more to get a full evaluation down. The first thing I noticed with Moreau was his ability to break on the ball. Playing with good acceleration which helps his recovery speed as well as his ability to get downfield, Moreau undercut and batted away/intercepted multiple passes on tape. Here we see this ability in action. Moreau remains patient in his drop, and reads the quarterback’s eyes and the receiver’s route to perfection. Once diagnosing the route, Moreau breaks on the ball and comes away with the interception. Fabian Moreau is a fluid athlete as well, and looks comfortable in his drops. Of course, he has fantastic speed, but his physicality and frame also impressed me. While I like the athleticism and fluidity other corners in this draft like Washington’s Sidney Jones and Florida’s Teez Tabor, Moreau combines that upper level fluidity with decent play strength. Moreau has the upper body strength to jam receivers at the line, and reroute receivers down the field. At 6′ 206 pounds, Moreau already has a solid frame for an NFL corner. He certainly isn’t “super” strong, but he does enough to make due with the strength he has. I wouldn’t expect him to play too much press-man, but he could make a living in a cover two scheme. Another area in which Moreau excels is with his field awareness. He does a nice job of using the sideline as an extra defender, and angling receivers to the sideline on vertical routes. Moreau is a very smart, experienced player, and it certainly shows on tape. Here we see his physicality, smarts, and fluidity all in one play. After getting his hands on and forcing the receiver to the sideline and out of bounds, Moreau then quickly flips his hips and boxes him out. His coverage on the play allows for the safety to come downfield and get the interception. As a tackler, Moreau is both willing and physical, but his technique must improve. He also must learn to use better angles on tackles, as too often he failed to make plays due to poor angles. Any Cowboys fans reading this know how frustrating a defensive back who messes up angles can be. Moreau also tends to be a bit grabby in coverage, and earned himself a few pass interference and holding penalties. I like his physicality, but he will need to be smarter with his hands at the next level to avoid being penalized. UCLA’s Fabian Moreau earns a second round grade for me, and joins the jumbled group of second round cornerbacks in this year’s NFL Draft. Moreau has the size, speed, and savviness to be a successful corner in the NFL. Personally, I like him more in an off-ball scheme, where he wouldn’t be asked to consistently play in man coverage. I think he would be able to play man, but he would make the transition quicker if drafted by a cover two team.